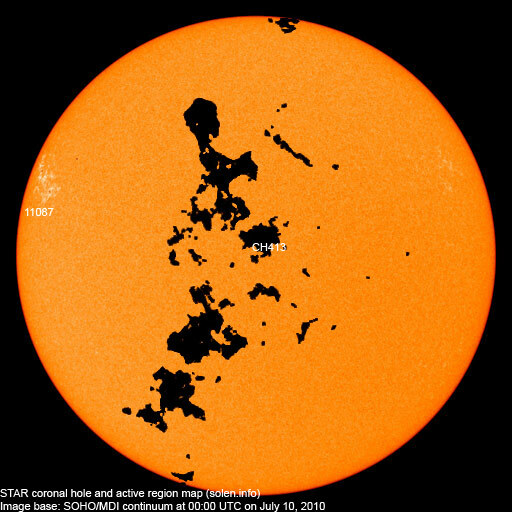 Last major update issued on July 10, 2010 at 06:10 UTC. The geomagnetic field was quiet on July 9. Solar wind speed ranged between 313 and 384 km/s under the influence of a weak coronal hole stream. 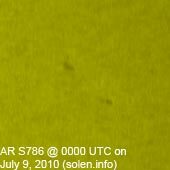 Solar flux measured at 20h UTC on 2.8 GHz was 80.0 (slightly flare enhanced). The planetary A index was 5 (STAR Ap - based on the mean of three hour interval ap indices: 5.0). Three hour interval K indices: 22211111 (planetary), 22221111 (Boulder). 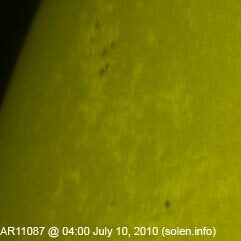 New region 11087 rotated partly into view on July 8 and was numbered the next day by NOAA/SWPC. The northern part of a large plage area is the most interesting as it has polarity intermixing with new spots emerging. An M class flare is possible despite the absence of large spots. Flares: C1.8 at 09:01 and a long duration C3.4 event peaking at 19:51 UTC. 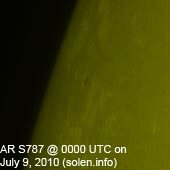 July 7-9: No obviously Earth directed CMEs were seen in LASCO or STEREO images. 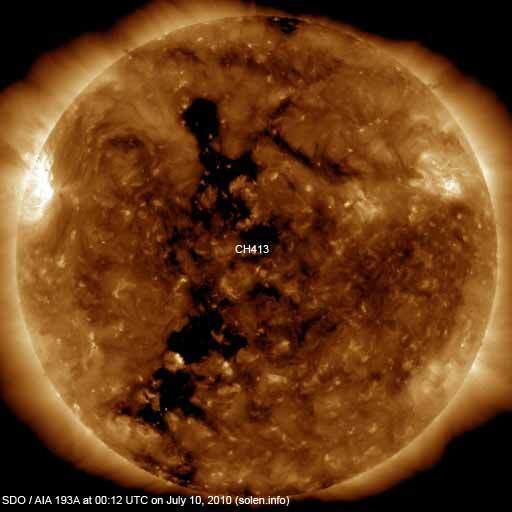 A recurrent trans equatorial hole (CH413) will be in an Earth facing position on July 9-10. The geomagnetic field is expected to be quiet on July 10-11. A high speed stream from CH413 could cause quiet to active conditions on July 12-14.